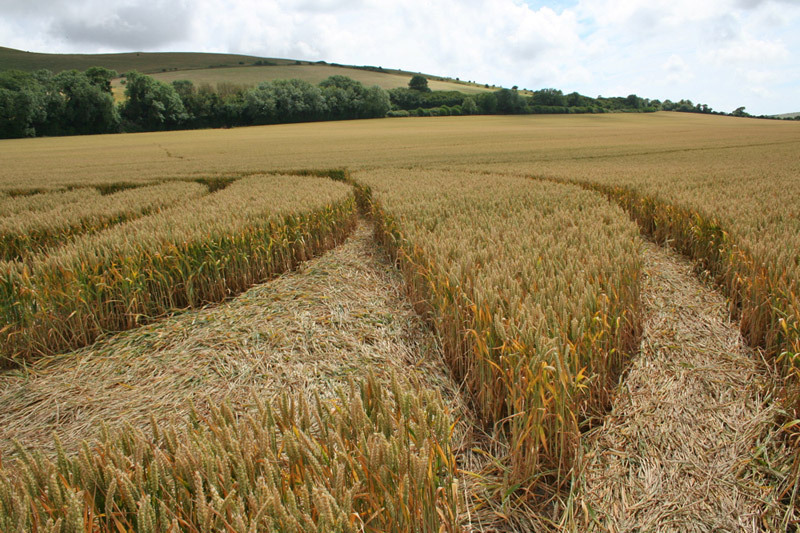 This new formation in wheat is the second to appear in East Sussex in 2014, after a complete absence of the phenomenon in the county for several years. 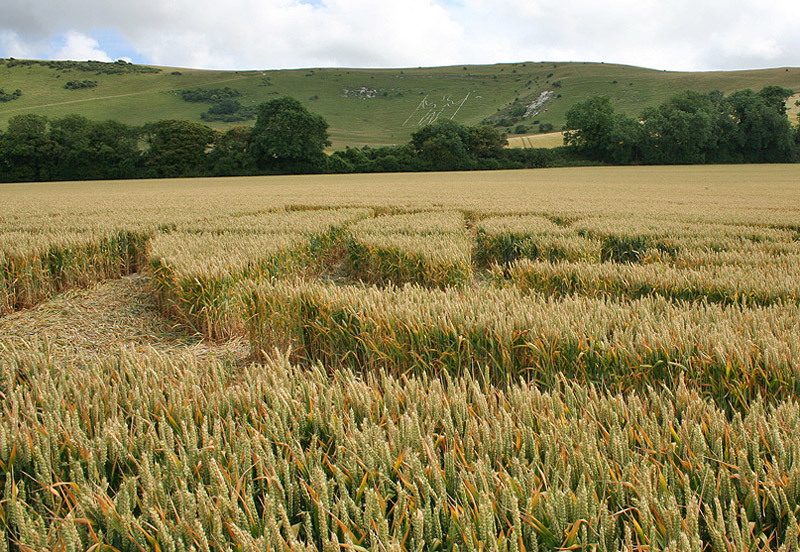 This is more complex than the earlier single circle in Falmer (about nine miles from here), and lies around a quarter of a mile west from the famous ‘Long Man of Wilmington’ emblem on the chalk downs, the origin and age of which remains a mystery in itself, although it is reckoned to be at least several hundred years old if not older. 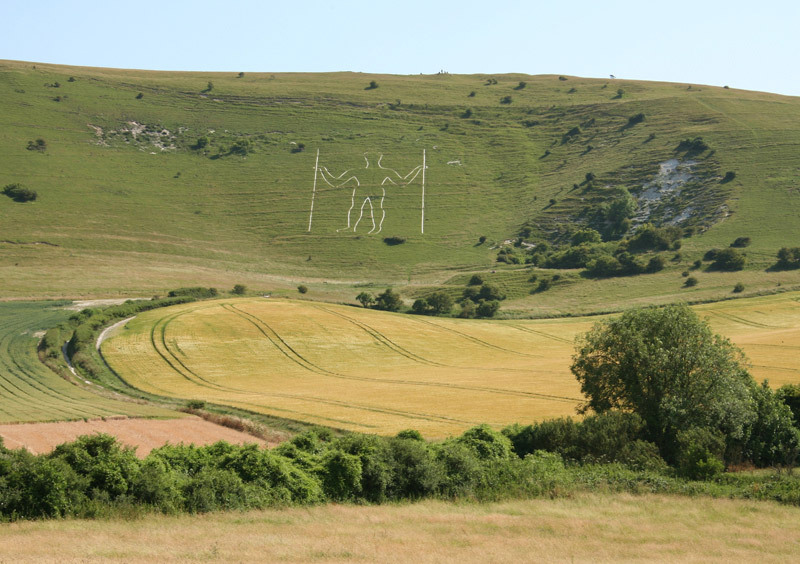 Although the Wilmington formation lies to the west of the little country road (‘The Street’) that runs near the Long Man, and it is easy to see that something is there in the field, it is hard to get a clear view of its pattern from that angle. Aerial shots reveal a rather smart pentagon motif containing a central star and radiating semi-circles, neatly laid out. 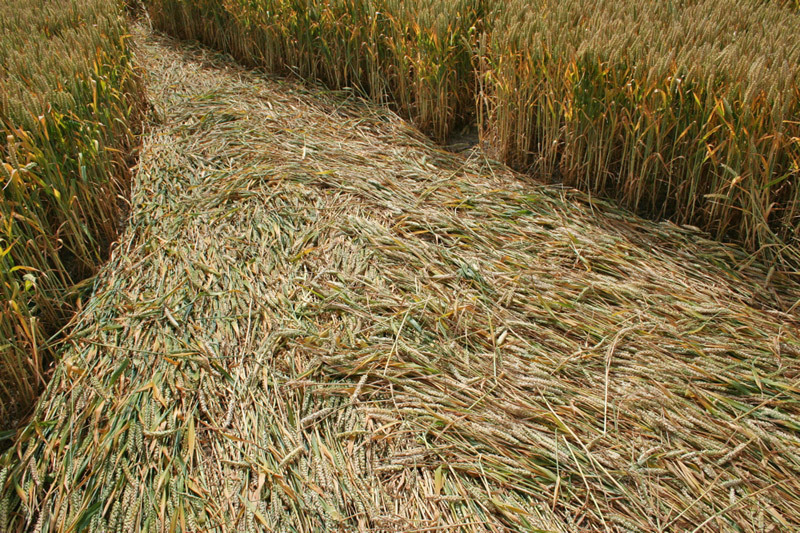 As an approximation, it is probably about 150 feet in diameter. 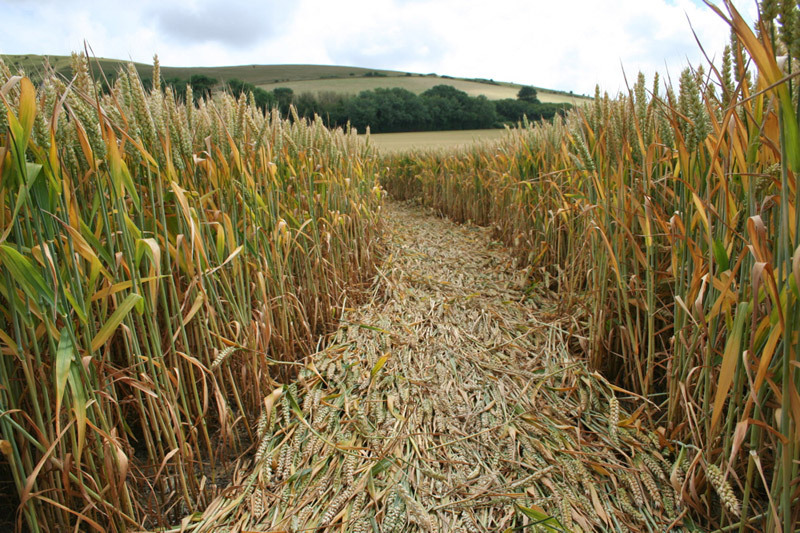 This field was once host to a formation in July 1990 (two circles and two rectangular paths, one attached to the larger circle, the other disconnected from the main design), while the actual field at the foot of the Long Man hosted an ingenious mandala of thin crescents in July 1995. The Wilmington area (and nearby Alfriston, which was also active in 1995) has been bereft of formations from that time until now, so it is nice to see their return here after a long absence. Following my short report last week, having been able to visit the Wilmington formation at closer quarters since (kind thanks go to the farmer, who has - so far - been tolerant of visitors), I can add a few more details. The overall exact diameter of the formation is in fact 126 feet (our original estimate was 150 feet, which wasn’t such a bad guess). 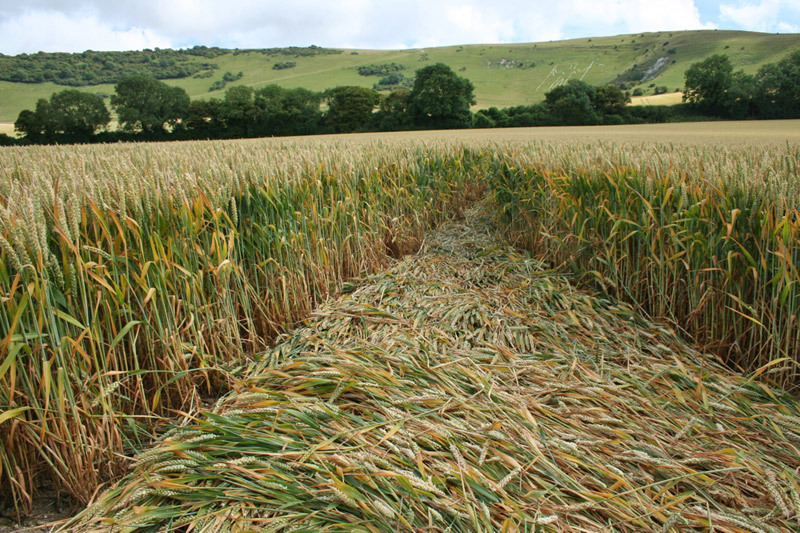 The lay, although notably worn from its original state due to a weekend of excited visitors, shows some interesting, if slightly odd, flows in places (see ground photos), going off at tangents from time to time to curve back around on themselves for no apparent reason. Straightforward paths are generally neat. 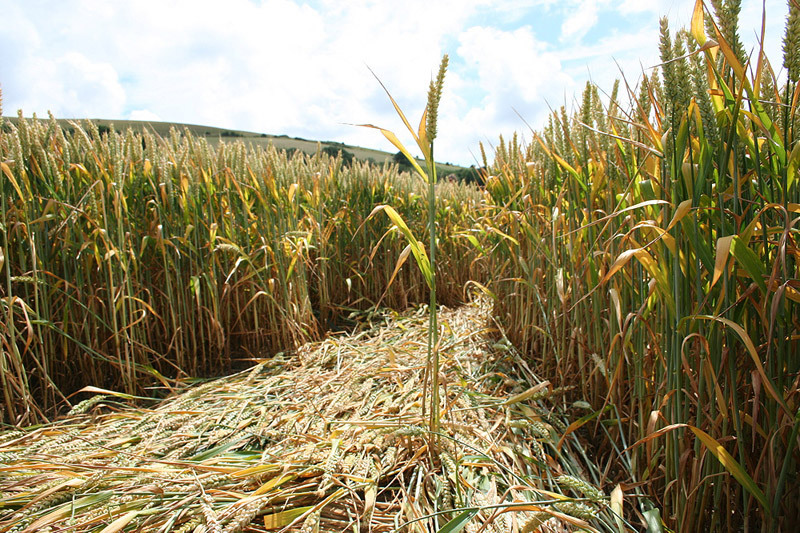 The flattening of one path had managed to completely miss two stems, which were standing up, unaffected. As has been noted by a number of observers, the design seems to echo the general style of the formation which appeared last year on 1st August 2013 near Stonehenge. 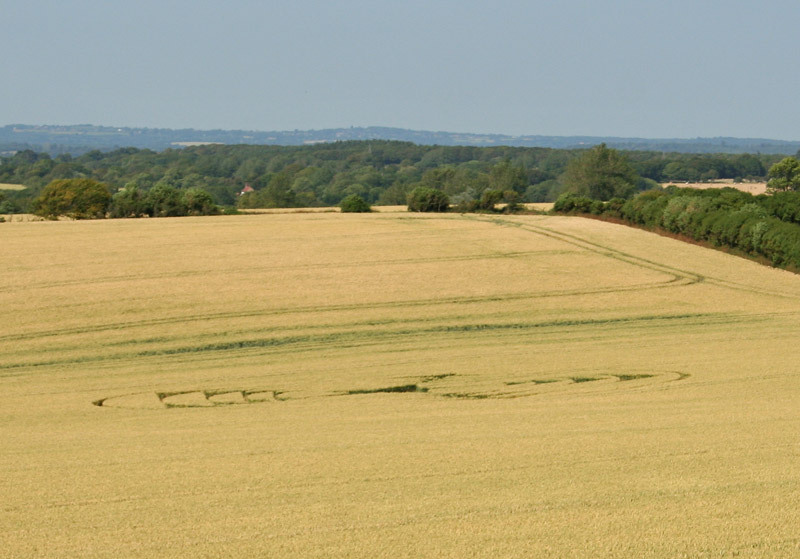 As such, it feels closer to the Wiltshire ‘ethos’ than any traditional Sussex style of yore, almost as if the growing hostility of the agricultural community in the usual heartlands has driven the phenomenon back out to the provinces (as we have seen in other counties this year), perhaps to make a point. A circular protest, or just pragmatism? 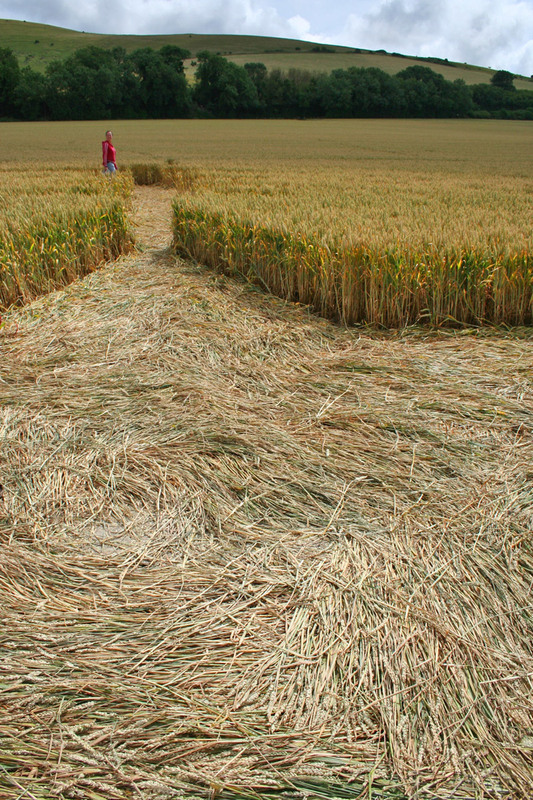 One other observation: people actually thinking to measure crop formations are obviously seen as the weird ones these days, rather than those who sit and meditate in them. A group of women who sat themselves down to monopolise the centre of the formation to ‘commune’ while we were attempting to run a large tape measure across it were seen making mocking imitative gestures behind our backs, as if collecting data was the most ridiculous thing to do. Whatever happened to live and let live? There’s nothing wrong with meditating, of course, but taking the odd measurement never did anyone any harm either (indeed, the recording of accurate dimensions is something that probably isn’t done enough in crop circles anymore). Now at least we’ll have it for posterity that the formation was 126 feet in diameter… who knows when, one day, this might turn out to be revelatory for someone?